“There’s no place like home for the holidays,” claims the popular Christmas song. 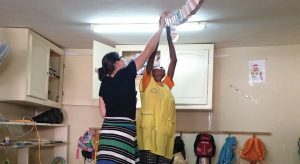 For many ELCA missionaries, however, celebrating Christmas away from home is an opportunity to bear witness to the blessings of the global Lutheran church. 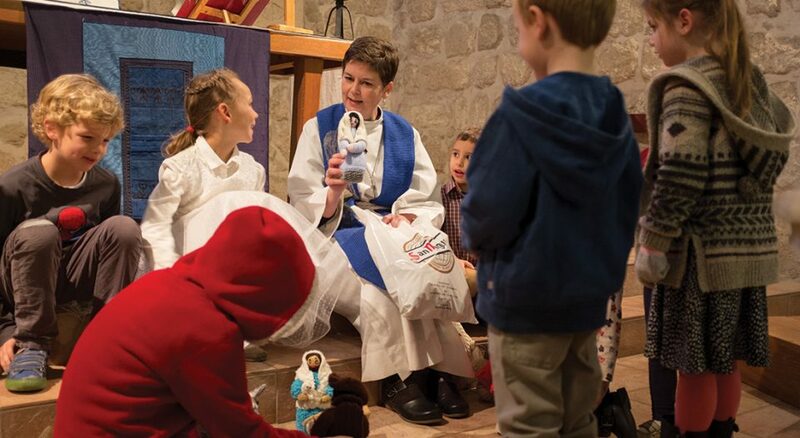 As they share Christmas worship, meals and other traditions in a rich diversity of cultures, many missionaries discover a new understanding of the church holiday—and their faith—along the way. 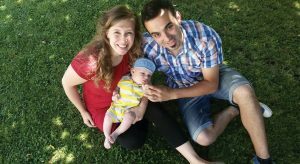 Here’s what six missionaries have observed from their unique contexts. In Argentina, Krystle Moraska said Christmas heralds long summer days, lush green landscapes and the end of the school year. 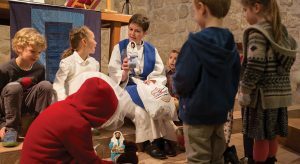 Congregations of the United Evangelical Lutheran Church, which serves both Argentina and Uruguay, offer Escuela de Navidad or Adviento (“Christmas/Advent School”), a program that resembles vacation Bible school. The climate prompts its own symbols for the holiday, like one popular Christmas song that describes bringing flowers to the baby Jesus. Families come together for Christmas Eve fireworks and a late-night dinner around a big table—for Madrussan’s family in Bariloche, Argentina, a whole grilled lamb is usually on the menu. Moraska and Madrussan encourage YAGM volunteers to experience Christmas with their host families and communities. They also host an annual evening of Christmas music and cookies in their home. Together with their 2-year-old son, Emilio, the couple looks forward to Christmas as “a time when everything starts to slow down, when you can ask, ‘How was the year?’ and reflect,” Madrussan said. Thanks to its religious diversity, “Malaysia has the most public holidays of any country in the world,” said Wendolyn Trozzo. Christmas is no different. In Borneo, a weeklong city Christmas fair offers a stage for local congregations to perform, and the governor and prime minister sponsor Christmas greetings on a downtown billboard. 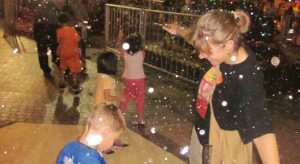 There’s even snow, sort of—it’s manufactured from the same tiny soap bubbles that movies use to simulate winter. Although Christians make up just 1 percent of the population of Israel and Palestine, Carrie Smith said both Muslims and Christians take pride in their communities’ role in the Christmas story. The Evangelical Lutheran Church in Jordan and the Holy Land offers Christmas fairs, bazaars and a school Christmas program; the town of Beit Jala holds an annual parade for St. Nicholas; and Christmas Lutheran Church in Bethlehem hosts English- and German-speaking congregations from Jerusalem for a joint Christmas Eve service. To Smith, this signifies the strength of the faith of Palestinians living under occupation. “We don’t give up our hopes for peace and justice because we know love was born in Bethlehem. … God has not abandoned us and, in fact, God was born among us,” she said. Local markets sell Christmas trees; tinsel appears on doors and cars; and in schools of the Senegalese Lutheran Development Service, both Christian and Muslim students celebrate the end of term with a Christmas program featuring songs and presentations from their cultural traditions. Père Noël (Father Christmas) arrives to dance by the tree and give gifts (provided by parents) to every child.